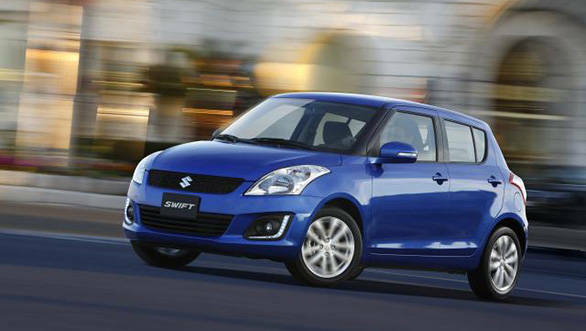 Maruti has opened bookings for the Swift facelift at over 1,370 outlets across India. The hatchback can now be booked at Rs 10,000 with dealers promising deliveries within weeks. Going by the spy shots and our knowledge of the international variants, the Swift facelift carries over the old hatchback's front fascia but with added L-shaped LED elements which run beside the fog lamp enclosures. The design of the alloy wheels has also been tweaked. The side profile and tail lamps are similar to the outgoing car. Like in the Ciaz, the new Swift is expected to come in ZXi and ZDi+ variants. The changes inside the cabin are significant as compared to the outside. Top variants get a push button start, Bluetooth enabled music system, auto folding mirrors as well as reverse parking sensors. The engines too get a minor revision. This isn't a complete engine overhaul like Suzuki did in the UK by introducing the dual jet petrol engine which laid claim to better power delivery and more fuel efficiency. Instead the tried and tested 1.2-litre petrol engine doing duty in the current Swift has now been modified for better efficiency. Same is the case with the 1.3-litre DDiS motor. This time around, the Swift is also expected to come with a petrol automatic option. Expect Maruti to marginally raise the prices of the new Swift.